The vikings had a great enemy back in the day but they came victorious. In this tower defense game it is time for you to do your part and write the history of all the greatest battles. 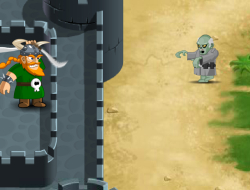 Stay on your castle wall and start destroying the zombies with you weapons. For each one you kill you get some golden coins with which you can buy upgrades to become better equipped for the combats ahead. Use the powers on the right side of the screen to decimate through them and also there is a berserk option on the left that will make you and your attacks much stronger. Zombie Defense 0.00 between 0 and 10 based on 0 votes.